I was so happy to spot a Julie G nail color display over at my local Rite Aid, this past weekend. The display consisted of holiday inspired nail colors that were very festive, indeed. I picked up the two shades that intrigued me the most-Gift Wrapped, and Light It Up ($3.99, each). Let's take a closer look at these two beauties! Gift Wrapped: Magenta with fuchsia micro-shimmers. How lovely is this nail color? I love it! The fuchsia micro-shimmers are very smooth to the touch, and they compliment the magenta base beautifully. The shimmers really stand out. My nail swatch picture does not do gift wrapped any justice. The color and effect is one hundred times more stunning in person. Trust me. I had never tried Julie G nail colors before so I didn't know what to expect when it came down to the formula. Well, I am happy to say that the formula on this one was nice to work with. The color just glided on the nails. The first coat went on sheer, but as soon as I added a second coat, everything evened out and I obtained rich, opaque coverage, with a shiny finish. Drying time was pretty average. It wasn't terribly lengthy but, I would give this one a good 5-7 minutes to fully dry and set. Light It Up: Clear base with large hexagon shaped, and small round mutli-colored glitters. Honestly, it's just inevitable for me to not pick up a clear based glitter nail color when I see one. I think they are so awesome to have in your collection, and the glitters add a fun and festive detail to any nail color it's layered over. In order to get the most glitter particles on the nail bed, I suggest lightly patting on the glitter with the nail brush instead of swiping it on. This tip always comes in handy when I am working with sparse glitters like these. Saves lots of time and frustration. The glitters do feel textured on the nails, but a top coat is sure to smooth things out a bit. Overall: I am very pleased with these two Julie G nail colors. The colors, as well as the formula, do not disappoint. What's even better is how affordable these are. I want more! I am definitely going to pick up more Julie G nail colors next time I stop by my nearby Rite Aid store. What do you all think of Julie G's nail colors in Gift Wrapped and Light It Up? 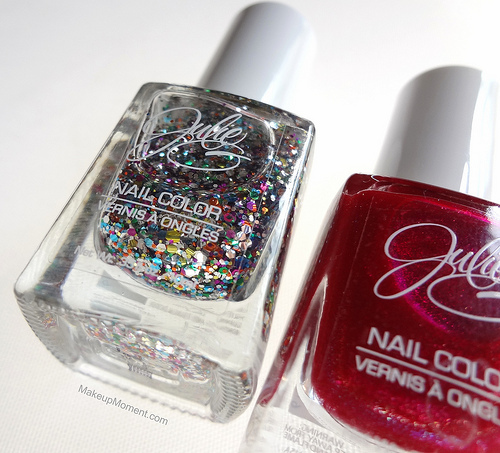 Which are your favorite Julie G nail colors? Oooh Light it up is really pretty! I don't have a Rite Aid near me, but next time I'm by one, I'll be sure to get these! Thanks, Elizabeth :) When you give them a try, let me know how you like them! I can't wait to pick up some more colors! Ooo I need to go to Rite Aid to check these out! I've seen these at rite Aid but wasn't sure if I should pick them up - the two you picked are gorgeous!! Thanks! I really liked them. I can't wait to pick up more!